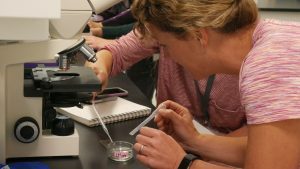 BAR HARBOR, MAINE — The MDI Biological Laboratory will take a national lead in teaching data literacy to students and teachers though a five-year, $1.2 million SEPA (Science Education Partnership Award) grant from the National Institute of General Medical Sciences, an institute of the National Institutes of Health. Residents of Maine and New Hampshire rely heavily on private wells for drinking water, but few have their wells tested and some standard tests in Maine do not include arsenic, which has been designated by the U.S. Environmental Protection Agency (EPA) as the environmental contaminant with the biggest impact on human health. Long-term exposure, even at low levels, can lead to severe health problems, including cancer; diabetes; heart disease; and reproductive, developmental and cognitive problems, including lower IQs in children. Arsenic is a particular problem in New England’s coastal “arsenic belt,” where up to 60 percent of wells have levels that exceed EPA limits. Under the project, entitled “Data to Action: A Secondary School-Based Citizen Science Project to Address Arsenic Contamination of Well Water,” students will learn how to manage and analyze data about water collected from their homes and to communicate their results to inform action at the local, regional and even national levels. Disney, who directs the project as principal investigator, will collaborate with Bruce A. Stanton, Ph.D., a professor of microbiology and immunology at Dartmouth’s Geisel School of Medicine, the former director and a current project leader of the Dartmouth Toxic Metals Superfund Research Program and a visiting scientist at the MDI Biological Laboratory. The “Data to Action” project is an outgrowth of an EPA-funded environmental education project called “All About Arsenic,” on which the MDI Biological Laboratory also collaborated with Dartmouth. While that program succeeded in educating the community about the arsenic threat, it also identified a need for improving data literacy. The “Data to Action” project is supported by Science Education Partnership Award (SEPA) grant 1R25GM129796-01 from the National Institute of General Medical Sciences.